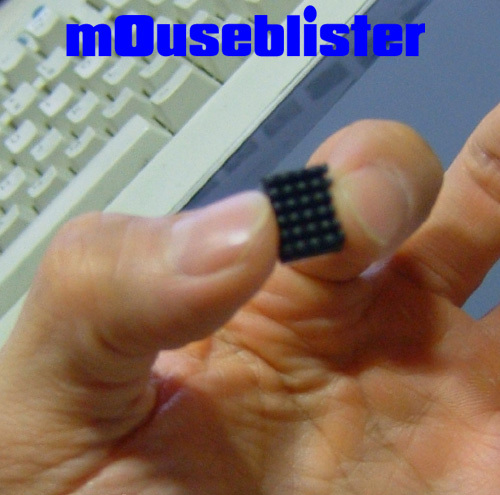 Get your Mouse Blister Today!
" ...I think they might actually work. It will allow you to slightly alter the shape of the mouse to better fit your hand ergonomically ..."
" ...helps to modify the size of your mouse—something that can make things more comfortable if you have big hands..."
"...MouseBlister as it makes your mouse look as though it is suffering from a serious case of blisters, although the advantageous might outweigh your ego..."
"... Intended to prevent your mouse from slipping out of your hand, shooting off across the desk or leaving you with a twisted, withered claw...made from the same rubber you’d usually find on the hand-grips of motorcycles, only thicker and more tenacious..."
"...If you have trouble gripping your mouse because it’s too slippery or if you just enjoy sticking pieces of rubber all over stuff, this is the product for you..."
"...MouseBlister Reduces hand Fatigue...bits that you stick on a mouse that prevent the mouse from getting slippy..."
"...someone with big hands, I can appreciate — and keeps your mouse firmly in your grasp since, you know, computer mice are really slippery..."
"...Mouse Blister to the rescue! 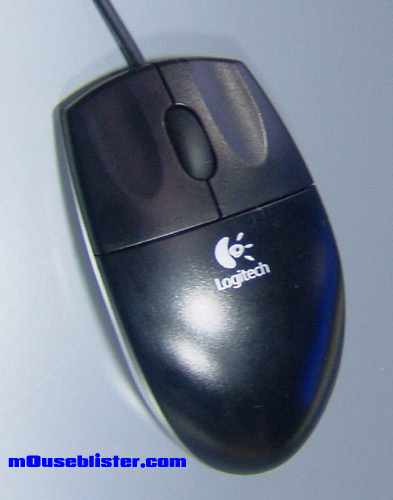 Are your hands too large to properly manhandle your computer mouse? 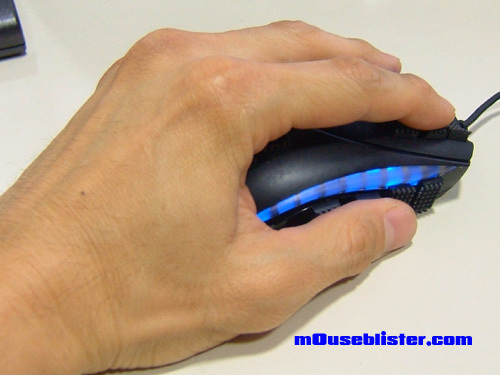 ..which is pretty cool, as a whole; no one else’s mouse is going to look like that...the Mouse Blister is supposed to help your large hands comfortably grip the mouse as comfortably as possible. And it gets even cooler...How often do you find a neat mouse accessory that has all these amazing, health-improving benefits?..." 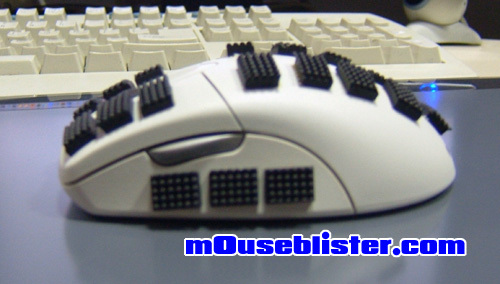 These funny looking Blisters really do make your mouse feel better, or your money back! Everyone Loves Their Mouse Blister! "Wow, what a difference it makes! I've been suffering from tendonitus for years and these Mouse Blisters helps a great deal. 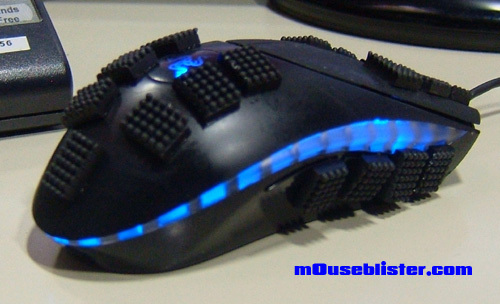 My mouse never felt so comfortable! " " I use the computer all day, and these Mouse Blisters are a God send! Thank you, thank you!! So simple but yet so effective!! " " Can you good folks come out with different colors? I'd like to deck out mine in mean red white and blue! BTW, this product really works! 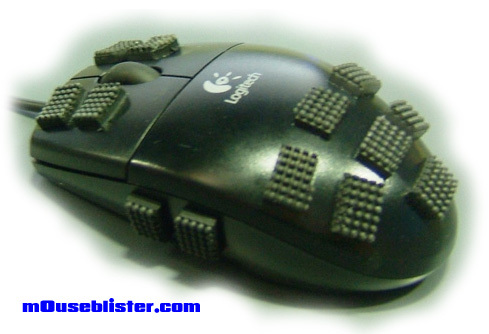 The blisters is awesome.. "
" I would recommend these to everyone who uses a mouse. A MUST HAVE!! I bought them for everyone in my office and reduced fatigue is obvious. Everyone loves them!.. " 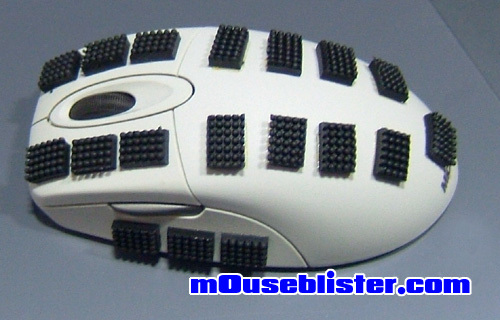 " I would encourage anyone who's a programmer or graphic artist to GET THIS PRODUCT... "
" My hands feel much better after using the Mouse Blister.. "
" I've always had sweaty hands and this made using my mouse difficult. The Mouse Blister really helps.. "
" My mouse feels more comfortable.... "
" They look better in person compared to the photo. " 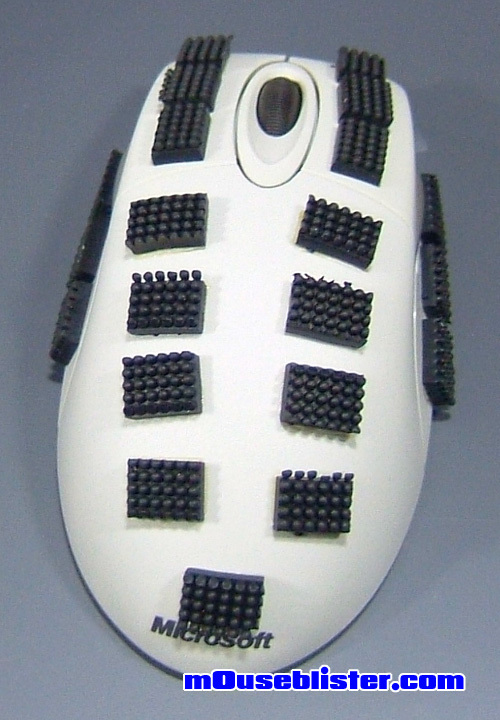 " I can game for long periods of time without releasing my hand from my mouse... pretty-damn satisfied customer.... "
Comes with 25 blisters - just peel and stick! Reduces Hand Fatigue - Long Lasting - Grippy as Heck! - Very very Comfortable Feel! 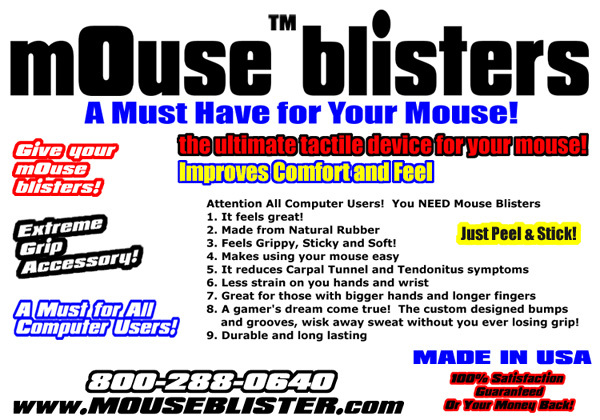 Thank you for your interest in the new Mouse Blister™. I invented this product in order to reduce daily hand strain. 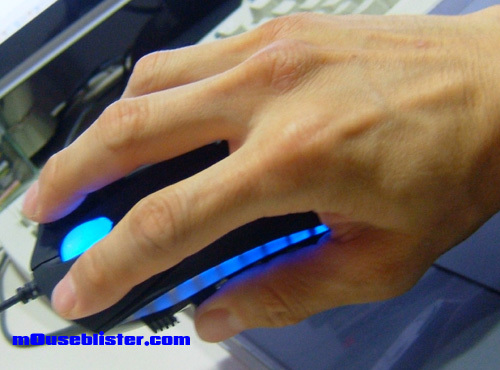 I guarantee that this product is better than anything on the market today, and will help reduce hand fatigue and make using your mouse more enjoyable. The grip is unbelievable! We started with natural rubber, cooked it at exactly the right temperature, added small gripper bumps to increase tactility and wisk away sweat. You'll find this simple product amazingly effective and you'll never go back to your old mouse (the way it was). It took me more than a year to develop! This product is custom designed and was inspired by the sticky feel of motorcycle hand grips. For those with big hands, this product is a Godsend. 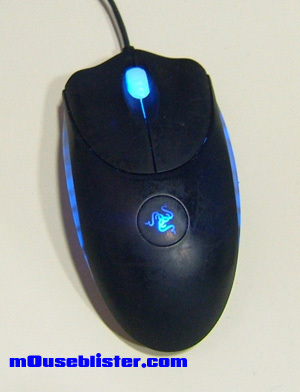 It literally increases the overall grip size of your mouse, and it'll fit larger and better in your hands. Employers, if you have employees that use their computers daily, this is a MUST product! Reduce hand CTS symptoms and help minimize the long term wear and tear on hands due to years of computer use. This product is still in Beta mode and I received my first 911 batches and I'm making it available to you for $8.99 w/ Free Shipping. I guarantee you'll love this product or send them all back to me and I'll refund you the full amount. 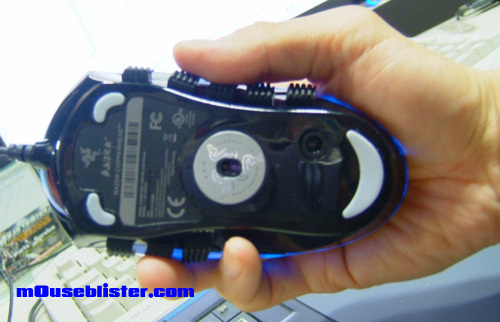 Using durable, soft but sticky rubber, the mouse blister™ uses the same grippy material found on motorcycle handlebar grips. It's thicker, long lasting and it works awesome! 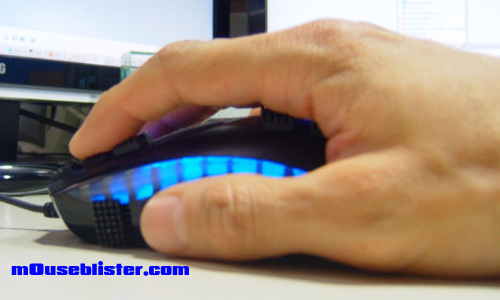 Apply to any mouse or hand held device and get that extra grip. Diminishes hand and wrist fatigue. A must have for webdesigners, gamers and graphic artists. 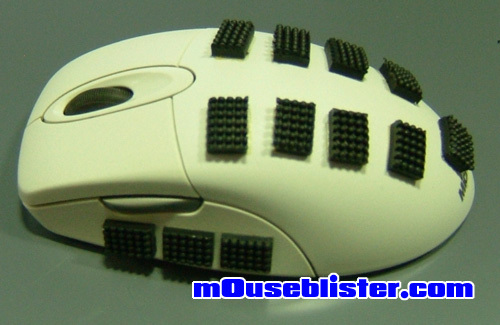 Reduces discomfort associated with prolonged mouse use, including Carpel Tunnel, Tendonitis and general hand fatigue. It's not a question of "if" you'll experience computer related hand fatigue, but "when". Great for extreme gamers, power users, and every computer user. Ask your doctor, physician or chiropractor, we're sure they will agree! Approx 1/2" x 6/16" x 3/16". Not yet available in stores. Call 714-879-8882 ext 231 for more information. Black. Soon, available in Red, Blue, Yellow and White! Great as a Corporate promotional item! 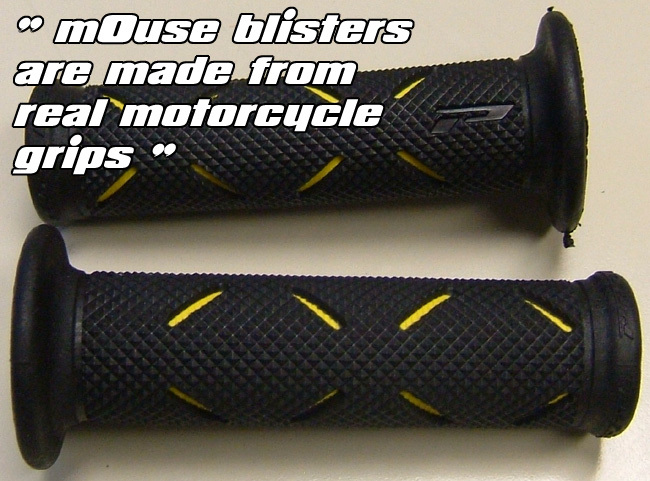 Mouse Blisters are grippy as these motorcycle grips. Super natural rubber material. Inspired by moto grips. A single blister held between thumb and forefingers. Stick 'em anywhere you make contact w/ the Mouse. Notice the custom bumps and ridges. They wisk away sweat and keep your grip tight. 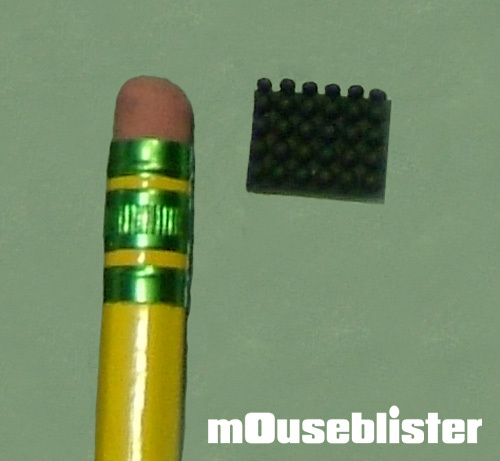 A mouse blister compared to the size of a pencil head. * The blister adds better feel and ultimate grippiness. * Makes it easier to palm the mouse and for easy manuevering. Copyright © 2016 Mouse Blister (TM) | 714-879-8882 | * 30 Day Satisfaction Guaranteed or your Money Back!